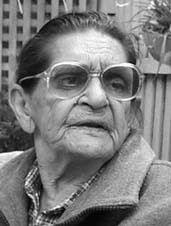 Joyce Ingram was born in 1922 at Bateman's Bay, and spent her childhood in Redfern. She lived in Leeton for nine years, marrying Charlie Morgan in 1942. She had four children; Norma, James (born at 138 Lawson Street, Redfern), Ruth and Donald (Donee). After marrying George Lockyer Ingram, she moved back to what later became known as The Block in 1949. A stalwart defender of the The Block, in 2004 she finally left 78 Eveleigh Street to move to Waterloo. Aunty Joyce Ingram: I first arrived here on The Block in 1923. [When I came back] I squatted in 23 Louis Street because my house was overcrowded. I lived in 23 Louis Street for nearly twelve months. I left there because the police were pretty solid around here at the time. The people who lived on The Block at that time were real community people, they helped one another and they shared with one another. I left here and I went away to Tumut for a week or two. When I came back I lived In Wells Street. I got a house, 41 Louis Street. They moved me from Louis Street to 29 Louis Street and I lived there for quite a few years. I had two great-grandchildren with me then. I had to leave from there because the house was set on fire so I went and I lived in Waterloo for a while. I finished up in Douglas Street. I put in then for another house and I was moved in to 92 Eveleigh Street. Now I’ve got four great-grandchildren with me, besides the grandchild. I exchanged houses with another person because the house was too large where she was. I moved into 78 Eveleigh Street and the lady who was living there, she came from Moree, she moved into 92. From then on, I’ve been living in 78 Eveleigh Street for the past twenty-three years and I don’t intend leaving there at the present time. At my age, I’m seventy-nine, I think it is a little bit too old to pick up stakes, pull up roots, go and plant myself in another place. It would be rather ridiculous. Aunty Joyce, can you tell us some of the experiences you had while living on The Block? I don’t know what happened then, but they were already stopped from doing that. People used to keep their places clean. It was a real pleasure to live there then because we had houses right around The Block. it was a gathering place for the Aborigines back in them bygone days. It is still a gathering place because it is like Mother Earth calling us back on to this land, if it is only just to sit and reminisce, I just sit still, for what reason I don’t know, but it is a gathering place for Kooris. We call ourselves Kooris because we are not full-blooded Aborigines and we are not white people, we are in between. We are a Koori people. We are indigenous Aborigines. We have got no song, we’ve got no dance, we’ve got no language. This is the first piece of land that was ever given back to the Aborigines, from what I can gather, and it was given back by Gough Whitlam. It would be a great shame for us to lose this place now to another lot of people. Once this little bit of land, no bigger than a grain of mustard seed, once this land is gone, the rest of the Aborigines around New South Wales and maybe all over Australia would lose a little bit of something that was already given back to them. We can thank Gough Whitlam from the bottom of our hearts for this little bit of land. But I really believe that if this place was given new blood, as a person’s body would be given new blood, it would come to life again. I believe by having houses here, homes for the people, not apartments but homes that they can be proud, our children, future generations [will] be happy and walk with a little bit of pride and dignity that at least they have got a home they can be proud of. I am living for that day to see these houses be built here for our people. Aunty Joyce you talked about some of the memories back in the days when you first moved to The Block. Have you got any other experiences that you want to share with us about some of the things that happened down here at that time. Aunty Joyce Ingram: They will be a little bit rough and cruel, but the whole of this place in the first start of it we can thank the people who fought for this little bit of land. They fought for it and the police came down and raided the place but the cars were turned upside down to barricade the streets to stop them from assaulting the Aborigines and taking them off the land. We’ve been raided by police over and over again for the least little thing. They even use this little bit of The Block here to do a little bit of training here at times. I can say this for a fact because I stood and watched one of the sergeants. He had a stop watch in his hand to see how long it took his younger police to catch a young Aboriginal person, a young boy about seventeen, bailed him up and dragged him up the back of the lane in what time. As he stopped the clock he said, “Good on you boys. You done that in good time.” I can swear on the Bible for that. I stood there and I listened to him. They belted this young Aboriginal boy up and it was a great shame. We’ve always had the police here raiding the place, but it’s only lately that they’ve backed off because since Mundine has taken over The Block, or taken over the office, we’ve lost a lot of houses. A lot of people have been put off the land and we don’t get the police so much now. Only when they want to practise or train. If they want to come on to the land, they go and ask Mickey Mundine and he tells them to go in. So I hope I don’t get my neck cut off for this, but these are facts. They raid the houses for drugs, but they don’t hit the right houses, they only hit the ones that Mickey Mundine has told them to go into. How was it for you as a mother with children? How many children did you raise down here? Was it really hard? Aunty Joyce Ingram: I will be quite honest. I had four children. I lived around here from the age of nine months, I can’t remember but I was told this by my mother, I really belong to this land here. My sister was born here, I am fifteen months older than her. We lived all around Redfern, touch of Waterloo, tip of Surry Hills and Chippendale. I met my first husband in Redfern, got married in Redfern. I had my eldest son in Redfern. Lost my grandmother at 106 in Lawson Street, Redfern. I lost my cousin in Thomas Street, Chippendale. Also my mother. She was ninety-six when she passed away. She preferred to go to the old people’s home where she passed the rest of her life away. So I really belong to Redfern. [Redfern has] a special meaning to me because [of ] the way we lived around here. We see the people change, we see the place has changed. It was really a good place once upon a time, but now it is really dying and it is a great shame to think that Redfern is dying a slow death. Well I really believe the caring and the sharing is still here but it is not so strong because there’s not enough people. Like I said before, if you get new blood into a dying body it has got to come to life. When it comes to life, there has got to be flowers and trees to grow around. That’s what I really believe in. It has got to have new blood in it. Is there anything else you’d like to talk about, memories of The Block. Aunty Joyce Ingram: I remember when I was only fourteen, fifteen, the Salvation Army used to come down here a lot. Then we had another two, mother and daughter, their name was Anderson. Her and her daughter Aggie Anderson, they were Christians. They were Islanders. They used to preach in the street here and sing with music, but they sang and harmonised like they had a band behind them. We’ve always had the church here. We’ve always had somebody coming in with the word of God and they are still coming in. I think that is really great because if we have got the energy of a church and the word of God being spoken here in truth and friendship, this place will stay alive. I really believe that. I’ve got three great-grandchildren now. My eldest son and his children are here, live in Eveleigh Street. My eldest daughter, she had two sets of twins, they was in Eveleigh Street. I lived all around Eveleigh Street, Louis Street, Caroline Street. My life story would [take] a long time just to reminisce.